Cathedral Arts Live is an innovative performance series dedicated to providing high quality performances at an affordable price. 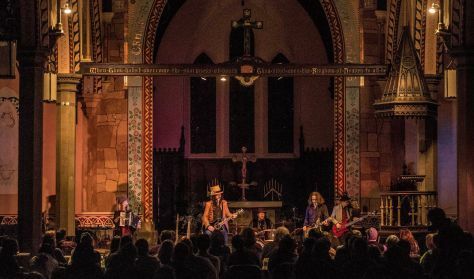 We welcome a diversity of artists, performers, and audiences to experience the hospitality, beauty, and unique performance space of Jersey City’s Grace Church Van Vorst. As part of our continuous endeavor to create community, this series aims to foster relationships through the arts. This program is made possible in part by funds from the New Jersey State Council on the Arts/Department of State, a Partner Agency of the National Endowment for the Arts, administered by the Hudson County Office of Cultural & Heritage Affairs, Thomas A. DeGise, County Executive, and the Board of Chosen Freeholders.